Hey there! Thanks for dropping by Official St. Maarten Tourist Bureau Blog! Take a look around and grab the RSS feed to stay updated. See you around! It was only natural that as the culinary capital of the Caribbean St. Maarten should host the best wine and food festival in the area. Here you will be delighted by the wonderful food of great chefs and the sublime wines of the best vineyards from around the world. You will have the opportunity of interacting with these masters of culinary excellence, of meeting them personally and tasting their other worldly creations. But you will also have the opportunity of learning and experiencing personally how to cook from these great chefs, how to taste their great wines and to experience what it takes to achieve greatness. But most of all, this will be an opportunity to enjoy the Caribbean like you have never experienced it before. 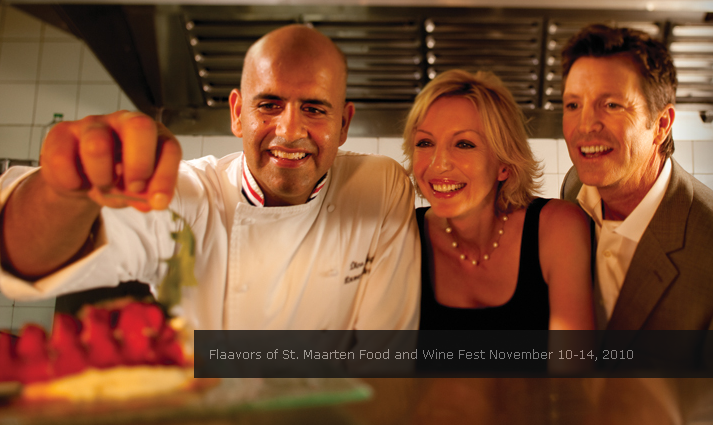 Come, join us for the St. Maarten Food and Wine Festival and five wonderful days in paradise! extensive damages or loss of life in St. Maarten. The island has been uninterrupted by the recent tropical storm and is waiting your arrival for a Maagical Caribbean Vacation!